Wilson Price Hunt and Donald Mackenzie left New York soon after the Pacific Fur Company was formed in 1810. The two men went to Montreal, and then to Michilimackinac to hire French-Canadian voyageurs and trappers. Two of the men hired while in Mackinac were Ramsey Crooks, as a full partner, and Joe Gervais. Hunt and his men took the Green Bay, Fox, and Wisconsin rivers to Prairie du Chien, then down the Mississippi to St. Louis. Not wanting the expense of wintering his men in St. Louis, Hunt took the men up the Missouri to where they could live off the land, until the ice broke up in the spring. After his men were settled on the Nodawa River (Nodaway River), which was about fifteen miles above St. Joseph, Missouri, Wilson Hunt went back to St. Louis to hire more hunters and a Sioux interpreter. During the fall and winter, several men joined up at the Nodawa camp, including Robert McClellan and John Day. A former partner of Ramsey Crooks, McClellan was given two and one-half shares in the Pacific Fur Company. Hunt and the men hired over the winter left St. Louis in March, 1811. Accompanying him was another partner Joseph Miller with two and one-half shares, an interpreter Pierre Dorian Jr. with his wife Marie and two little boys. The boys were Jean Baptiste (five) and Jean (two). Two naturalists, John Bradbury and Thomas Nuttall—curator of the botanic gardens of Harvard University from 1825 to 1834—accompanied the westbound Astorians. After a few days at the Nodawa Camp, the Astorians started up the Missouri River on April 21, 1811. Manuel Lisa of the Missouri Fur Company hotly pursued the Astorians. When the Astorians left the Nodawa, Lisa was nineteen days, and about two hundred and forty miles behind them. Covering a period of two months and a distance of about eleven hundred miles, this remarkable keelboat race is one of the notable events in early western history (Chittenden). On Lisa’s boat was Henry Marie Breckenridge another naturalist. He and Bradbury both published books on their travels up the Missouri River. These books are the two firsthand accountants of travel on the Missouri, and the surrounding country. 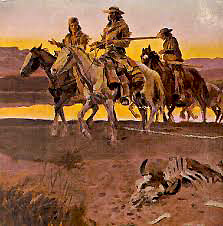 Five men joined the Astorians on the way upriver. Three of them, John Hoback, Edward Robinson, and Jacob Rezner, wintered with Andrew Henry of the Missouri Fur Company on Henry’s Fork of Snake River in Idaho. These three men reached the Missouri River by way of Jackson Hole, Togwotee Pass (elevation 9579 ft.), and the Bighorn Mountains. The other two, Benjamin Jones and Alexander Carson were returning from two years trapping on the upper Missouri. Wilson Price Hunt’s original plan was to follow the route of Lewis and Clark, but after talking to the new arrivals, he decided to follow the route of Hoback, Rezner, and Robinson through the Bighorn mountains, up Wind River, over Togwotee Pass, and into Jackson Hole. Hunt’s party reached the Arikara Villages at the mouth of the Grand River on the 12th of June, and he immediately started to trade for horses. Wilson Hunt could not get enough horses from the Arikara, so he traded his keelboat to Lisa for horses. When Ramsey Crooks went above the Mandan villages on the Great Bend of the Missouri after Lisa’s horses, John Bradbury accompanied him. By July 18, 1811, the Wilson Price Hunt Party had enough horses to start overland. After leaving the two naturalists with Lisa, Hunt’s party consisted of the five partners, John Reed a clerk, fifty-six men, a woman, two children, and eighty-two horses. Everyone walked except the company partners and the woman, Marie Dorian. Eighteen days later Wilson Hunt visited a Cheyenne camp. I bought thirty-six horses there at a price better than that which I paid the Aricaras. The Cheyenne are honest and clean. They hunt buffalo, and they raise horses that each year they trade to the Aricaras for corn, kidney beans, pumpkins, and some merchandise . Along the way, probably at the Arikara Village, Wilson Hunt hired Edward Rose as a Crow interpreter. We had in our company a hunter by the name of Rose, a very unpleasant, insolent man. We had been warned that he planned to desert us as soon as we should be near the Absaroka [Crow], take with him as many of our men as he could seduce, and steal our horses…. On September 2 we had received a visit from some Absarokas of a band which was different from the one which we had recently left and which was camped in the mountains. Consequently, I suggested to Rose that he remain with these Indians offering him half of his year’s wages, a horse, three beaver traps, and some other things. Rose stayed with the first Crow Indians Hunt encountered. A few days later, the Crow Chief found out Hunt was following the wrong trail. The Chief sent Rose to put them on a shorter, easier trail across the Bighorn Mountains to the Valley of the Wind River. The Astorians continued to the upper end of the Wind River Valley. Instead of going over Togwotee Pass, Hunt turned southwest on an Indian trail over Union Pass to the Green River Valley. The trail over Union Pass gave the party, its first view of the Teton Range. Hunt promptly named them the Pilot Knobs. 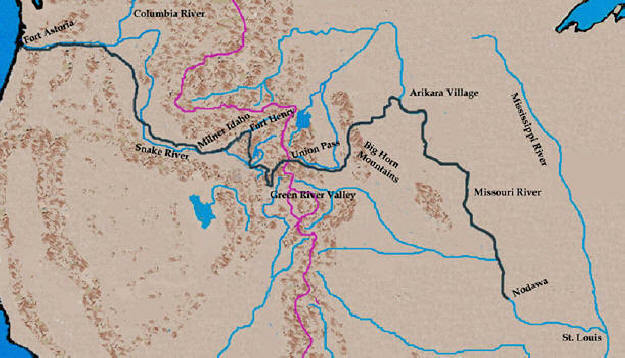 From Union Pass, Hunt could have followed the Gros Ventre River into Jackson Hole, but the hunters knew there would be little or no game in Jackson Hole. 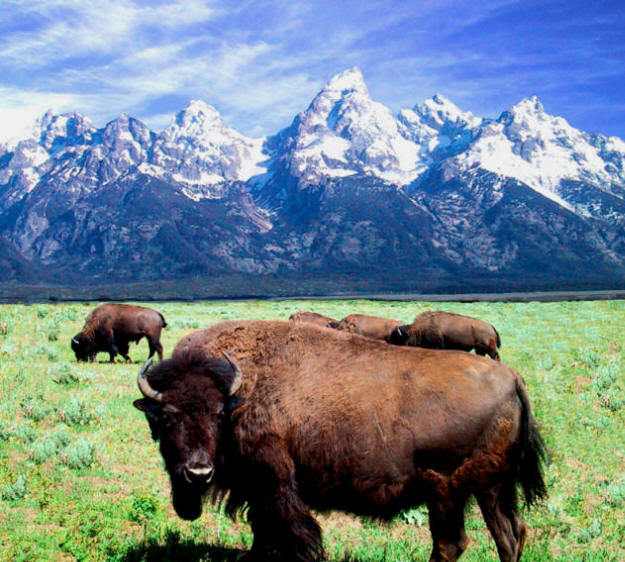 The best place to find buffalo was the Green River Valley. 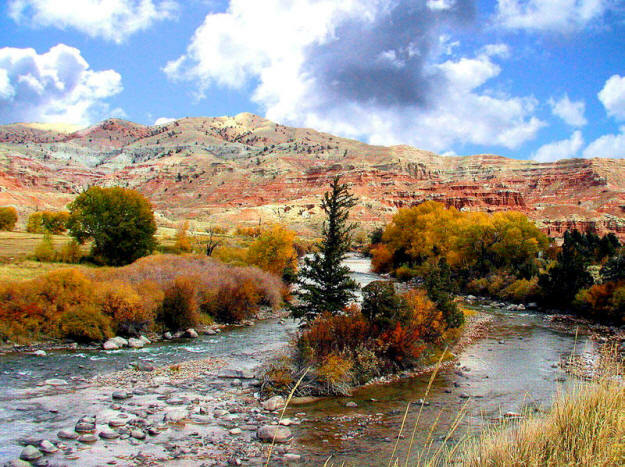 Once in the Green River Valley, Hunt hunted on the Horse Creek meadows for five days. During this time, the Astorians dried four thousand pounds of buffalo meat and traded with a band of Shoshone for another two thousand pounds. The Astorians proceeded up North Beaver, over the rim into the Hoback Basin, and then down the Hoback River to Snake River. At the junction of the Hoback and Snake rivers, Hunt left Alexander Carson, Louis St. Michel, Pierre Detaye, and Pierre Delaunay to trap the Jackson Hole and upper Snake River area, and then continue on to the mouth of the Columbia River. These were the first men to trap what would become the geographical center of the Rocky Mountain fur trade. Hunt and the rest of the party turned down Snake River searching for cottonwood trees large enough to make hollowed-out canoes. At present-day Astoria Springs, John Reed, John Day, and Pierre Dorian continued down Snake River while the rest of the men cut down cottonwoods for canoes. Reed returned in two days and told Hunt Snake River Canyon was impassable for canoes, or horses. After Reed’s report, the Astorians referred to the rapid, roaring river as the Mad River. With two Snake Indian guides, the Astorian crossed Snake River and followed a well-traveled Indian trail up Fall Creek, over Teton Pass into Pierre’s Hole, and on to Fort Henry. This is the description of Fort Henry from Hunt’s journal published in French and then translated back into English by Hoyt Franchère. We reached the fort of Mr. Andrew Henry. It has several small buildings that lie constructed in order to spend the past winter there. All stand along a tributary of the Columbia about 300 to 450 feet wide. We hoped to navigate it and we found some trees suitable for canoes. This is James Ronda’s description. 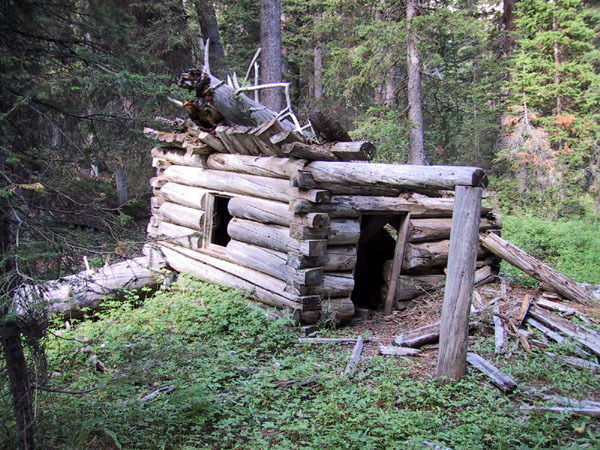 Little remained of the first American trading post west of the Great Divide. But the place meant more than the sums of its scattered stones and decaying buildings, and fireplace holes. This is historical fiction writer Washington Irving’s description. The weary travelers gladly took possession of the deserted log huts which had formed the post, and which stood on the bank of a stream upwards of a hundred yards wide, on which they intended to embark. Now, think about these descriptions based on the following…Andrew Henry with possibly sixty trappers crossed the Continental Divide in the fall of 1810, and left in early spring of 1811. In an area with little game and where no Indians wintered, why would anyone build a trading post or need a fort? In the few month Henry was there, with basically no tools, when did they do all this building? This cabin has stood for over eighty years, if there was a Fort Henry why did the buildings deteriorate so rapidly? The “buildings” of Fort Henry were far more likely to have been dugouts or lean-tos covered with brush. 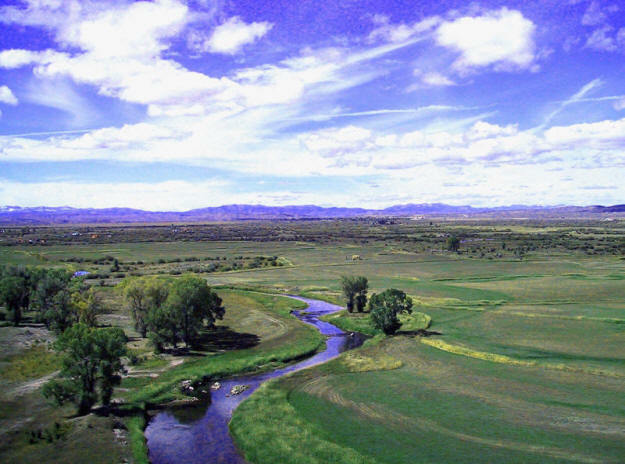 There is also good evidence Henry and the majority of his men were not on the Henry’s Fork of the Snake River, but at Camp Henry which was on Connant Creek near Drummond, Idaho (Lindsley). 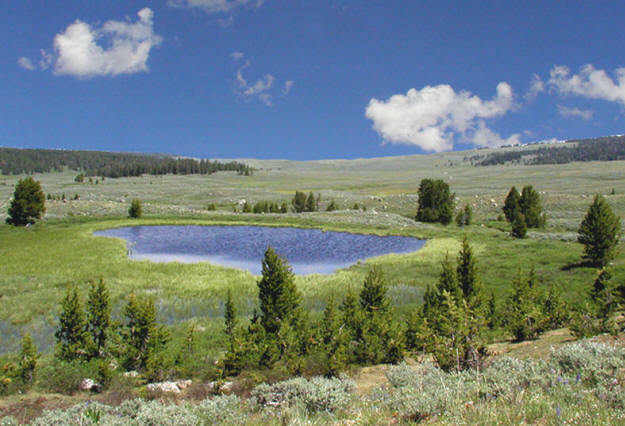 As soon as the mountain passes were open in the spring, Henry’s disheartened, starving men split off in all directions: some headed for the Spanish settlements; Hoback, Rezner, and Robinson went over Togwotee Pass, through the Bighorns, and onto to the Missouri River; Henry with a few men returned to Fort Manuel by way of the Yellowstone and Missouri rivers. We had cached our saddles in a spot that we showed the two young Snakes. They promised to take care not only of the saddles but also of our seventy-seven horses until one of us returned. The people of this area must suffer terribly from a lack of game…we left this place on October 19th . The Astorians floated down Snake River which Wilson Price Hunt referred to as the Canoe River. With some difficulties and portages, they managed to reach an area near Milner, Idaho [Washington Irving’s Caldron Linn]. Snake River entered a deep, straight-walled gorge and Crook’s canoe capsized. A French voyageur, Antoine Clappine drowned. our lack of food prevented any delay of our journeys we put to one side those things that were most needful to us and began to dig holes in which to cache the remainder… when we put our baggage and merchandise into six caches…we saw no way to continue our journey by water and prepared to go in different directions in search of Indians. After caching the goods, Ramsey Crooks started for Fort Henry to retrieve the horses. After a few days, he decided it was impossible to reach Fort Henry and return before snowfall. Hunt and Crooks divided the remaining men into two parties, each to proceed on its own. Hunt followed the north bank of Snake River with nineteen men, the woman, and two children, while Crooks and the rest of the men followed the south bank. The rest of the journey for the westbound Astorian was one of continual starvation and misery. A point of interest was Marie Dorian. The pregnant woman gave birth to her child early the next morning (December 31). Her husband [Dorion] remained with her in the camp for a day, then rejoined us on the 31st. His wife rode horseback with her newly born child in her arms. Another child, two years old and wrapped in a blanket, was fastened by her side. One would have thought, from her behavior, that nothing had happened to her…the Dorion baby died (January 7). Mackenzie, Reed, and McClellan left the main party and followed the north bank of Snake River to Lewiston, Idaho. On the way, they met another group of men, and floated down the Snake and Columbia rivers. The eleven men arrived at Fort Astoria on January 18th, 1812. Hunt’s party reached Fort Astoria on Feb 15th, 1812. Hunt wrote in his journal. Ramsey Crooks was too ill to keep up and John Day stayed with him. Crooks and Day finally reached the banks of the Umatilla River and followed it to the Columbia River. A fur trading party of Astorians found them on the Columbia in early May. Both men were practically naked and starving. The last two stragglers of the westbound Astorians reached Fort Astoria on May 11th, 1812. The Wilson Price Hunt article was written by Ned Eddins of Afton, Wyoming. To return to the Home Page click on Mountain the Fur Trapper logo.